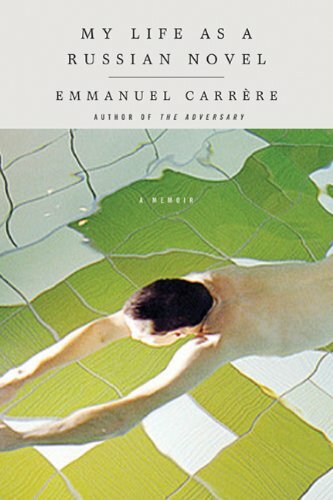 Emmanuel Carrère occasionally reaches Dostoyevskian heights of anguish in this memoir. Although he doesn’t actually murder anyone like Rasklonikov in Crime and Punishment, he plunges into states of intense introspection and despair to produce some psychologically tortured prose. Carrère is a French filmmaker, novelist, and biographer. My Life As A Russian Novel, translated from French, is written mostly in the first person but occasionally in the second, as he addresses both his former lover Sophie, and his mother, a leading French academic. Carrère utilizes various other literary tricks—changing tenses, planting information, laying false trails, and switching story lines at moments of crisis—to keep his readers in suspense. There are two key strands to this memoir: his Russian ancestry, with a dark family secret, and his emotionally harrowing relationship with Sophie. In the opening chapters he tells us of how he became involved in a film project focusing on the life of a Hungarian who was captured by the USSR during the Second World War and ended up spending half a century in a Russian asylum. Carrère travels with a film crew to the town of Kotelnich, where the Hungarian was held, to investigate the story and while there finds Russian—a language that he has not spoken since childhood—coming back to him. While the Hungarian’s story weaves in and out of the early pages, the focus shifts toward Kotelnich, the people who Carrère and his film crew meet there, and ultimately the writer’s Russian/Georgian background on his mother’s side. Early on we are told that her father, whose family fled to France from Georgia to escape the Soviet regime, became a Nazi collaborator during the Second World War and disappeared without trace following France’s liberation. Carrère’s relationship with his mother becomes strained as his interest in his grandfather grows. She fears that her son will write about the shameful family legacy that she has kept secret all her life and taint her with her father’s guilt. Meanwhile, Sophie, who is much younger than him, has a fairly average job and is uncomfortable in the smug literary circles in which he moves. A pornographic story he writes and addresses directly to her is published in the leading French newspaper Le Monde. It is supposed to be played out in real time as she sits on a train and contains precise instructions, often sexually explicit, about what she should do on her journey. Carrère, anticipating that other people on the train will be reading the story at the same time, encourages them to observe and take part. The memoir gathers pace in the second half, and there are some extremely uncomfortable scenes in which Carrère’s domestic life rapidly unravels in a series of dramatic revelations. My Life as a Russian Novel has a diary feel to it in which the writer has laid bare his soul, and this reviewer was left wondering if he should really be reading something so personal. Carrère’s portrait of himself is unflinchingly self-critical as he comes to realize how self-absorbed he is and the impact of his behavior on both Sophie and his mother. Several shocks and disturbing twists in the narrative, along with attempts at psychological self-analysis, make this an intriguing, often unsettling, but extremely rewarding read. Fyodor would approve. Tony Bailie is an Irish novelist, poet, and journalist. His new novel ecopunks (Lagan Press, Belfast) was published in November 2010. An earlier novel, The Lost Chord, was published in 2006. His short story, “The Druid’s Dance” was included in the award-winning Irish crime fiction anthology, Requiems for the Departed (2010). He has published two collections of poems, The Tranquility of Stone (2010) and Coill (2005).